Last year, health tech startup Siren told us that it was working on smart socks that could detect diabetic foot injuries. Now, the company is announcing those socks are being made available for everyone to buy. 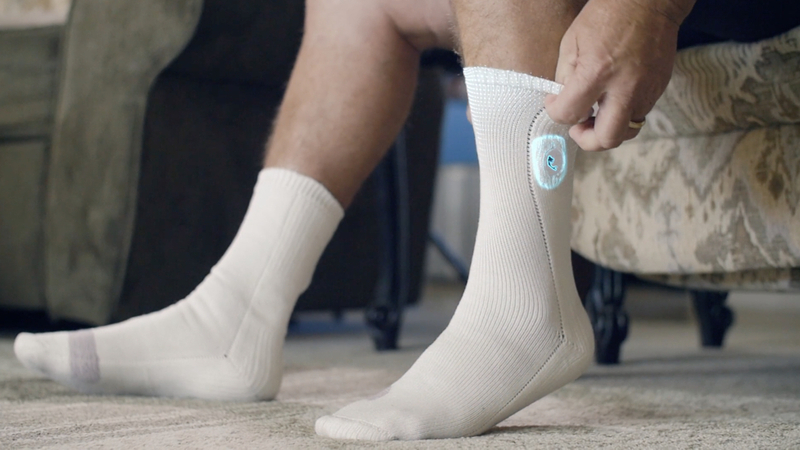 The socks have microsensors woven into the fabric which continuously monitor temperature; when they detect a rise in heat, a possible sign that inflammation is occurring, they'll alert the user with a smartphone notification or text message. The idea is to catch injuries before it's too late. Inflammation can lead to foot ulcers, but diabetics who suffer from nerve damage experience numbness in the legs and feet, which is why symptoms are often ignored. "I've spoken to several pediatrists and often when a patient comes to see them its directly to ER, directly to surgery, because its way too late by the time they notice because they don't feel pain," Siren CEO Ran Ma told Wareable. The socks are available on a subscription service of $19.95 per-month if you order in the first 30 days, $29.95 after that, for which you'll receive new socks every six months and access to the digital service. The socks are machine washable for over 100 washes, can be tumble dried and don't need to be charged. You also won't need to have a smartphone, as Siren offers a Bluetooth wall plug that will send data to the online portal over Wi-Fi. In the US, the costs of diabetes are staggering. The American Diabetes Association estimates the total cost of diabetes and prediabetes at $322 billion. Meanwhile, a study in California in 2014 found that diabetics in low-income neighborhoods were 10 times more likely to lose a foot or leg than their wealthier counterparts. Siren's goal is to put more power into the hands of people suffering from diabetes and negate the need for life-altering amputations. "We think the future is people wearing their comfy pajamas, their comfy socks, their comfy gloves, and these clothes having super powers," said Ran Ma. Some alpha testers have already received their socks, while general pre-orders will begin later this year with shipping set to start in November.